The school hosted its second annual Service Day on April 20 with students volunteering at nine different locations: the Arc of Monmouth, Lunch Break, Second Life Bikes, Ronald McDonald House, King James Elderly Care, Monmouth Medical, Search Day School, the Barn for the Poorest of the Poor and Trinity Hall. At each location, students dedicated themselves to benefiting the people of their Monmouth County. Despite some mundane tasks, students gave positive feedback from each location. At the Arc of Monmouth, an organization that serves children with intellectual and developmental disabilities, students assisted the children by keeping them company and playing various games with them. “Being able to see Jason’s reaction and happiness towards me for doing a simple task brightened my day,” said freshman Kelsey O’Kelly about her little friend, Jason. Meanwhile, at Lunch Break, student volunteers packaged goods, sorted clothing and helped distribute food to those in need in Red Bank. 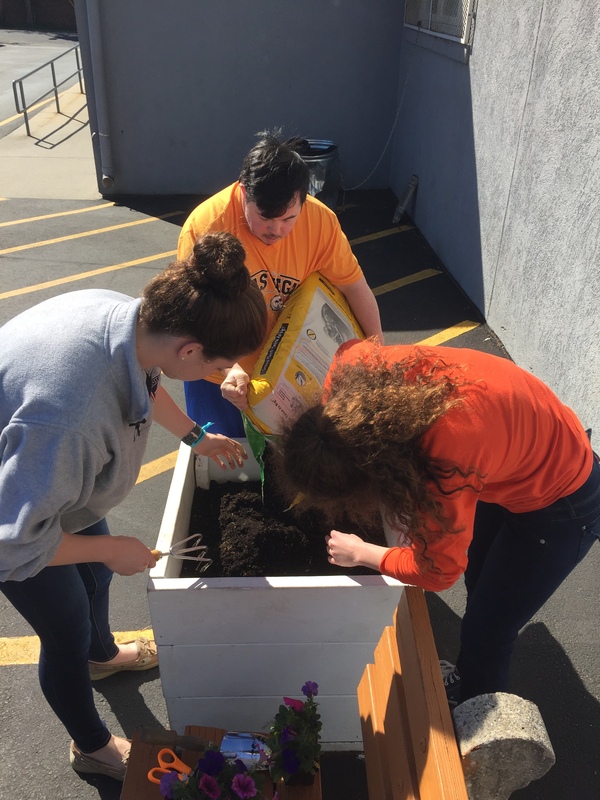 “Being at Lunch Break and seeing what small actions we could do to have a larger effect on our community was really impactful,” sophomore Jackie Fletcher said. Another group of students handed out gift bags to sick children and helped sanitized their rooms at the Ronald McDonald house in Long Branch. “Although my job at the Ronald McDonald house was not necessarily fun, it was much needed and appreciated as it helped make the house more sanitary for the families living there,” sophomore Kailin BurnsCohen said. Nearby at the Ocean Place Resort & Spa in Long Branch, students assisted and attended Monmouth Medical Center’s WEforum, a conference about women’s health and wellness. Though this was not a conventional act of service, the students certainly learned from their experience. “Seeing the amount of women that wanted to learn about their own wellness and bring it to their community was eye-opening and encourages me to do likewise,” sophomore Lexi Salerno said. A bit further down the shore at Second Life Bikes in Asbury Park, a group of students worked to repair bikes for those in the surrounding community who need to purchase bikes at a reasonable cost. 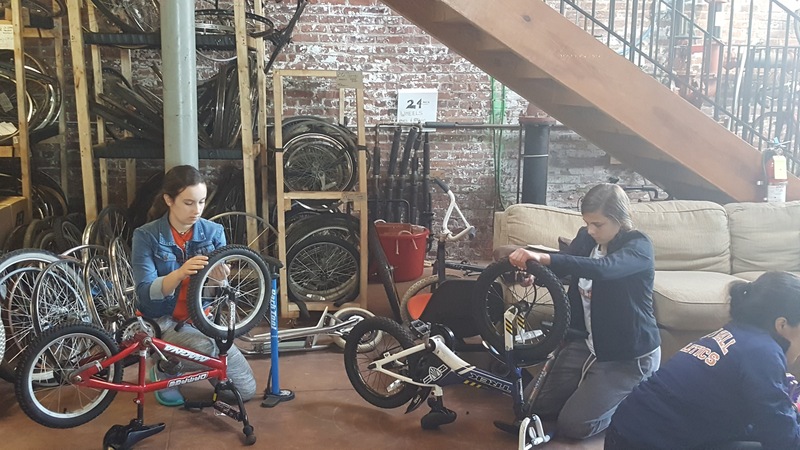 “It was really nice to be able to help the agency repair their bikes, and it was fun to learn some new bike repair skills while we were at it,” sophomore Brigid Clifford said. At Search Day school in Ocean Township, students worked with autistic children. “I was glad to have the opportunity to interact with my buddies from the Search Day school, especially the one who was nonverbal. It was an interesting and heartwarming experience to adapt to his way of communication,” junior Grace Molloy said. At King James Elderly Care, a senior care company in the Atlantic Highlands, students spent their day talking and playing games with the elderly. “I really enjoyed interacting with the residents and seeing them smile when we walked in; it brought a smile to my face,” sophomore Julia Henning said. At the Barn for the Poorest of the Poor, students organized food donations and cleaned hundreds of crates that the agency uses to deliver food to food banks and churches around NJ and NY. 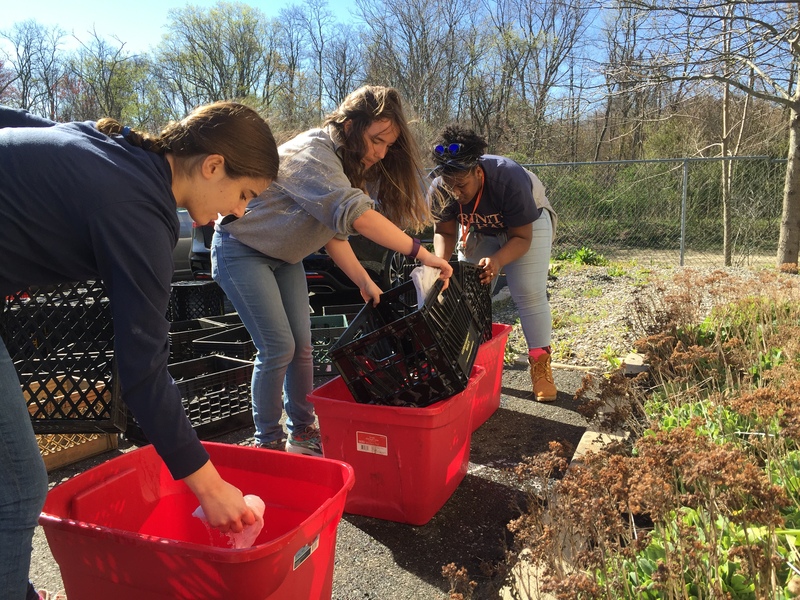 During Service Day on April 20, Grace N., Caroline M. and Kyla W. cleaned bins used by The Barn for the Poorest of the Poor to transport food to churches and shelters in NJ and NY. “It was nice to be able to help the barn’s job of delivering food to those who need it easier,” freshman Colleen Cusat said. Finally, some students stayed back at Trinity Hall to host a fun engineering day for younger students in the community. Using the knowledge they’ve gathered from their engineering classes, Trinity Hall students taught fifth to eighth grade students from Mother Teresa Regional School in Atlantic Highlands how to construct little robots, paper bridges and catapult launchers. After a long day of service, the students were satisfied with their contribution to their community and realized how their many small acts can collectively have a major impact on those in need in Monmouth County. May 18, 2016 in Features.